These Custom Brite Dock Smart Phone Holders are just a great way to get your Company brand-name out and about with the coming trends when it comes to both mobile and Smart phones. Long gone are the days of the pager, the Mobile Phone has become the swiss army tool of the 21 Century that everybody simply must have to remain productive and reachable in society. The great thing about these Custom Brite Dock Smart Phone Holders is that they are postable asa mail shot to customers, as the two feet are non-slip and totally removable and fit on the back on the dock, so you can easily assemble them when needed. 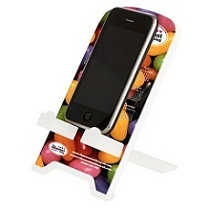 Why not hand these Custom Brite Dock Smart Phone Holders out to customers. The futures bright, the futures Custom Brite Dock Smart Phone Holders!! For a FREE QUOTE, please fill in the form regarding our Custom Brite Dock Smart Phone Holders and we'll be able to help you.